Theme updates are periodically released to introduce new features and maintain compatibility with the latest RapidWeaver addons and web browsers. You can tell if an update is available, by comparing the number shown next to the theme name in the RapidWeaver Addons Manager, versus the version number shown on the theme product page, on the ThemeFlood website. Significant theme updates are commonly publicised via the ThemeFlood blog, the RapidWeaver forums and over social media. You are welcome to get in contact and ask if there are any forthcoming updates for themes planned or submit feature requests of your own you want considered. Theme updates are not sent out automatically by email, because previously it was found many of the emails went missing in junk or spam mail folders. The costs were too prohibitive. Please always be certain that your RapidWeaver project files and addons are all backed-up before commencing any updates. You should already have Time Machine enabled on your computer and you can learn more about theme backups in the theme management article. As of 10th February 2017, updated themes are now installed in RapidWeaver with generic names (like Flood.rwtheme, Lake.rwtheme and Wilderness.rwtheme). We no longer append the version number of the theme after the theme file name. This is to ensure each newer version of the theme you install or update to will overwrite the previous version. However the version number of the theme is still shown to you in the RapidWeaver Addon Manager. This change has come about to ensure our themes will work more reliably with automated update checking utilities, like the theme update checker in RapidWeaver and the Waterfall plugin by Nimblehost. It will prevent the problem of many dozens of themes showing as needing updates, when you might already have the latest theme version already installed at the top of the list. As always, our advice remains that you work from duplicated / renamed themes, if you do not want updates to undo modifications (like custom banner images stored in the theme or code modifications in custom.css or custom.js files). It is always better to keep the original theme installed as a 'master' that can fetch your updates. Only apply project files to these 'master' themes if you're not making any modifications directly to the theme files. Minor updates will also be shown to you in the Nimblehost Waterfall plugin (detailed below) or within the RapidWeaver update checker. If you are considering updating from much older versions of addons, we kindly request that you repurchase the addons you require. What if I have duplicated / renamed a theme? Once you duplicate and rename a theme in RapidWeaver, it is given a special flag to exclude it from automatic update checking. 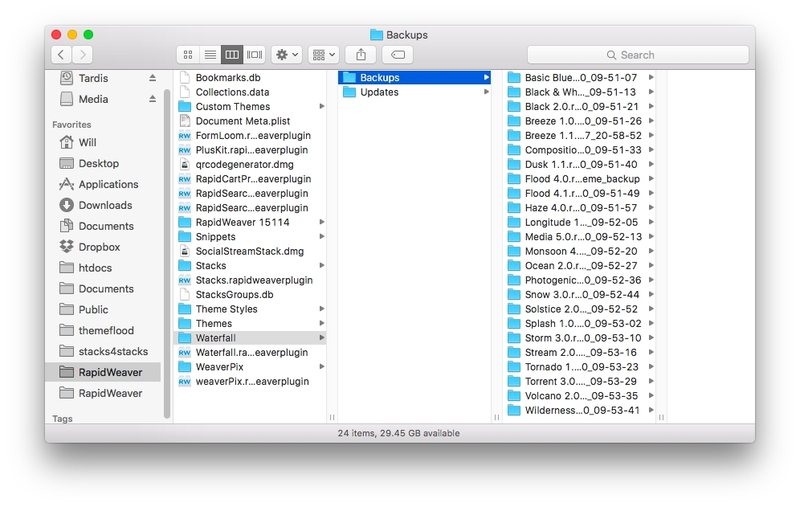 Going forward, the only way to update the theme would be to open the theme contents in Finder and physically copy any changed files across into the new version. If you purchased themes on or after 1st January 2015, you can access your Paddle Locker. 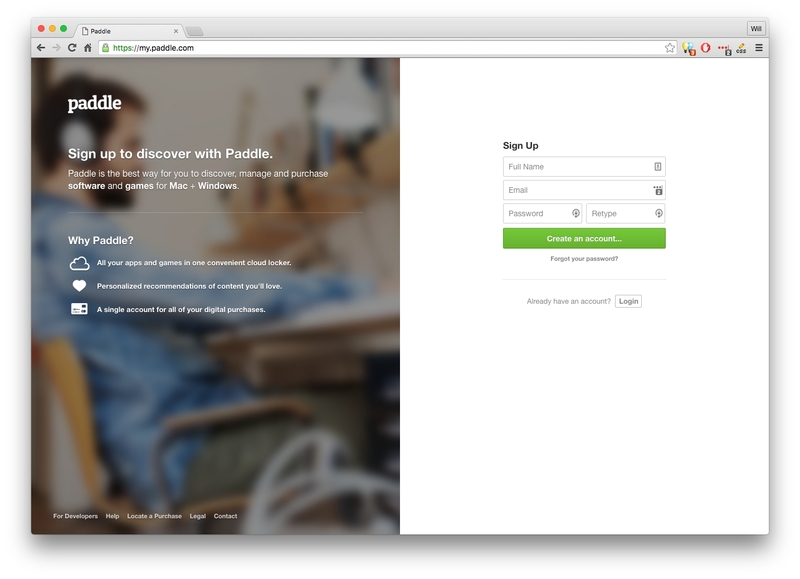 Paddle is the payment and shopping cart provider used on the ThemeFlood and Stacks4Stacks websites. Once you're logged into your secure locker, you can easily re-download themes again. The download links always point to the latest version of the theme. You can change your email address or password at any time in your Paddle Locker too. Waterfall is a small plugin for RapidWeaver, available to purchase from the Nimblehost website. A screenshot of the plugin is pictured below. Waterfall is added to your project as a new page. It lists all the third-party addon themes you've got installed within RapidWeaver and attempts to check for any available updates. 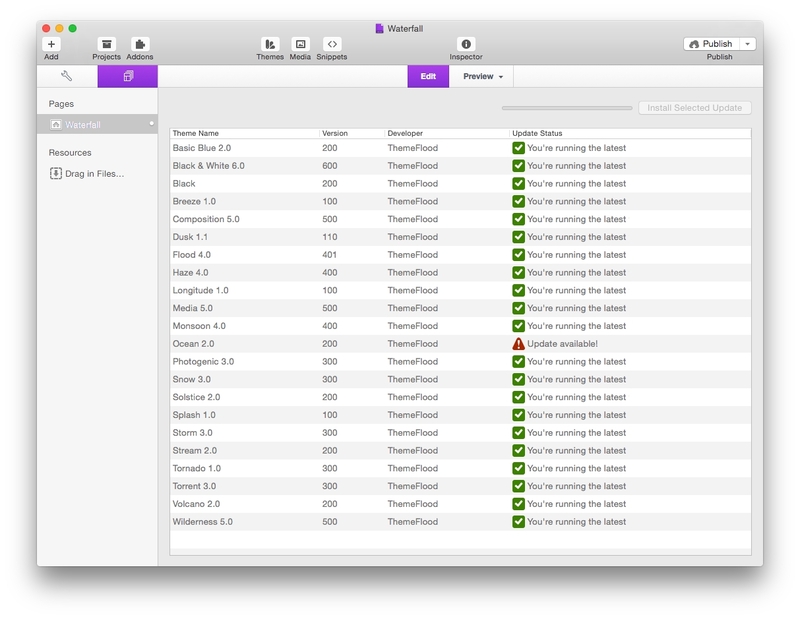 Theme companies like ThemeFlood have special 'appcast servers' which maintain a list of theme names and version numbers. The Waterfall plugin connects to these servers securly to check for updates. Waterfall will flag any themes that it finds updates for. At this point, you can just double-click to reinstall the theme again. If you prefer, you can choose to use Waterfall purely as an update checker and continue to download available theme updates from your Paddle Locker. Please note that Waterfall update checking only works on ThemeFlood themes installed after 1st January 2015. Free demo versions of themes and copies of themes installed before this date will not check for updates automatically, because they lack the required data. Waterfall will only update original themes; those which you have previously duplicated and renamed for modification will not be updated.